How much should I spend on an office? The general rule of thumb is no more than 10% of your income. This made me think about our business, how far we have come, the current climate, the importance of flexibility, AND spending as little as possible while in the early phases of your business. However, I don't buy into the argument that all young businesses are best to operate from home in their early phases. Especially if, like me, you are at your most productive when collaborating, networking, sharing & expanding your ideas and are at your happiest around other people. In fact, I was a little bewildered by Quora's article appeared first on a Google search - when I consider it such terrible advice. Especially, when I am such an advocate for culture, clear values and progressing business in a steady and sustainable manner. I knew it was time for an office after my first year with my business DelaneyPR. My clients were getting bigger and working from home and cafes were no longer appropriate. I also had little children, so the mess and chaos was an unwelcome distraction from productivity. The decision to come up with a solution, that is now Kapiti's local shared office space, is one that has paid off tremendously - for my business and others that were in the same position. Almost 2 years on from when I first started coworking, I have made new business connections, won more business, started exporting, met my current business partner, narrowed my target audience, and made more friends that I could ever have hoped for. Friends that like me are determined, professional and so much fun. Today my business partner and I just had news that we have won another Wellington contract with an amazing New Zealand business seeking market engagement and that we will be able to go ahead with a Wellington office as well - we couldn't be happier. Business growth is not all about growing as quickly as possible, or working in dire conditions until later - it's about enjoying the journey. My business partner Jacinda Thorn (right) and I soon after Delaney & Thorn Public Relations was formed. Our lovely environmental planner Tess, working on a Kapiti local event, Coastella. A visit from the small business minister in 2016. Opening night of Kapiti Collective. 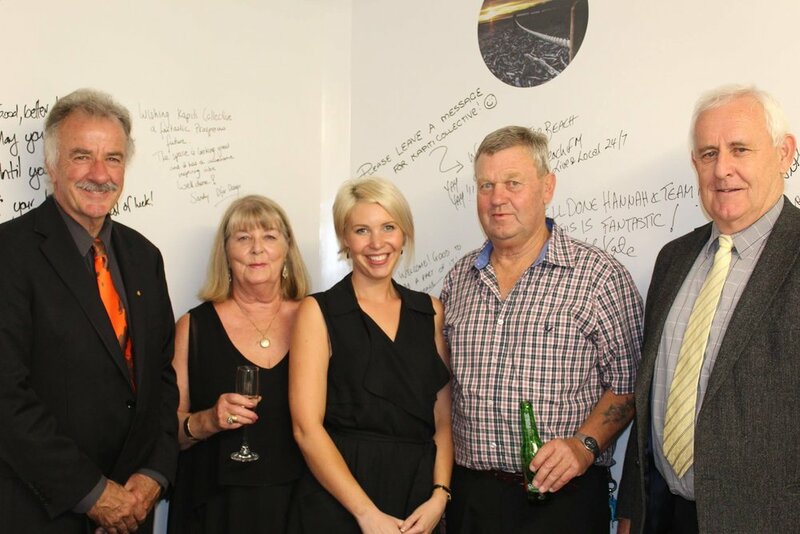 From left: Ross Church (Kapiti's mayor at the time), my mother Anne Delaney, me, my father, Paddy Delaney, and Dad's friend and Kapiti Collective neighbour at Quinovic Property Management, Bernard Parker. Mana MP, Kris Faafoi visits Kapiti Collective in 2016.